Facial recognition software is coming to industries like fast food and luxury shopping. Photo illustration by Slate. Image by Caliburger Professionals. 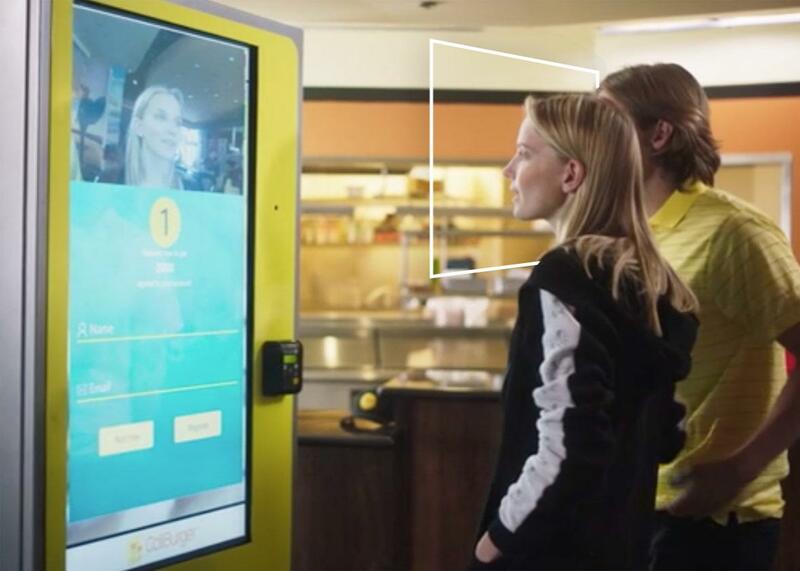 The burger chain CaliBurger on Tuesday began testing a facial recognition kiosk in its Pasadena, California, branch that can recognize customers who set up loyalty accounts. The kiosk allows select customers to access their accounts without any passcodes or card swipes and displays their order histories once the facial scan confirms their identities. “Our goal for 2018 is to replace credit card swipes with face-based payments. Facial recognition is part of our broader strategy,” CEO John Miller told the Verge. Facial recognition, it seems, is becoming part of the “broader strategy” in many industries nowadays, from fast food joints to social media companies to security systems. Some of it may be familiar at this point. Facial recognition has become a litmus test for a phone’s technological sophistication, as Apple, Samsung, Android, and other brands have incorporated various versions of the software in their devices. The Face ID login feature was a highlight of the iPhone X, according to early reviews (though security researchers claimed they’d figured out how to hack it a week after the phone’s release). In 2014, Facebook announced it had developed software called “Deepface” that could determine with 97.25 percent accuracy if two photographs feature the same face—around the same accuracy with which a human can identify faces. On Tuesday, the company unveiled a feature called Photo Review that informs users when their faces appear in photos, even if the uploader hasn’t tagged them. Law enforcement agencies have been active as well. Watchdogs discovered in 2016 that around half of all American adults have their photos in the FBI’s facial recognition database, which the bureau has been using since 2011 to track and identify suspects. Yet, the software had a 15 percent rate of inaccuracy—higher than Facebook’s—and incorrectly identified black people more often than white people. CaliBurger is part of the trend’s extension into commercial uses. As the sampling below shows, it may start popping up in places you’re not used to having your face scanned. These are mostly tests right now, but they’re also a sign of where the technology may be headed next. In September, a KFC branch in Hangzhou, China, revealed that it would be allowing customers with registered accounts to pay for their meals using facial scans, similar to the system that CaliBurger has set up. The software also recommends orders based on a customer’s age, mood, and gender. Canadian branches of the luxury outlet began using facial ID technology in 2016 for security and tracking customers. Images of people from camera feeds in stores are cross-referenced with a shoplifter database to weed out threats and with VIP databases to identify who should receive special treatment. Airlines such as JetBlue and Delta have announced last summer that they would be partnering with Customs and Border Protection to test facial recognition technology for identifying passengers at gates in a handful of airports. The aim is to replace tickets by using the technology to compare facial scans from boarding passengers to a federal database of passports and visas. The retail giant reportedly filed for a patent in 2012, which resurfaced earlier this year, that would use recognition software to identify unhappy customers from their facial expressions. While it’s possible that Walmart won’t end up developing the technology, the patent filing reveals the company’s thinking on the matter. At one point, it reads, “Often, if customer service is inadequate, this fact will not appear in data available to management until many customers have been lost.” It also notes that the facial recognition software could allow the chain to cut down on staffing costs.